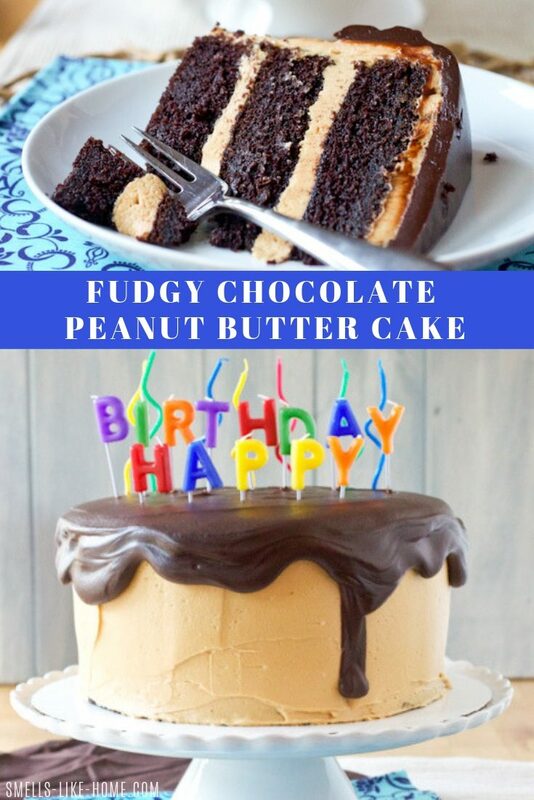 Fudgy chocolate peanut butter cake – The most famous chocolate peanut butter cake out there. It will “blow” all of your other birthday cakes away! Over the years, I’ve made my fair share of chocolate cakes (and cupcakes). But this one, my friends, is like no other. And it really should come as no surprise to me that I keep finding recipes that are one better than the next but let’s be honest here: I’ve been sitting on this one for over 4 years. I should have known it would be an amazingly great and over the top cake – look where I found the recipe. Kyle, that lucky man…I pull no punches for his annual day of gaining a year. He asked for a chocolate peanut butter cake this year and he sure as heck got one. 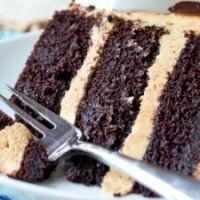 Three layers of impossibly fudgy, impossibly chocolatey, stick-to-the-roof-of-your-mouth cake stacked high, then filled and frosted with a light and fluffy peanut butter frosting. And if that can’t put a smile on the birthday boy’s face, let’s just add a coating of chocolate peanut butter ganache on top. You know, just for kicks! It’s like eating a giant peanut butter cup! 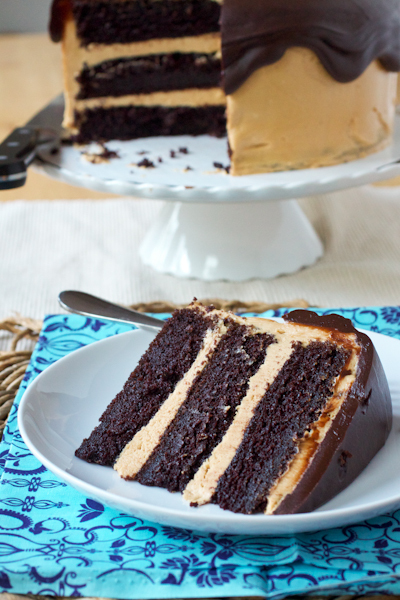 The man deserves a cake like this fudgy chocolate peanut butter cake: he’s my rock, my world, my dishwasher. Now, this may look like a difficult cake to make from scratch but trust me, it’s easy! You’ll make the cake batter in one bowl, people, ONE BOWL! 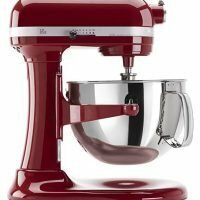 No stand mixer required! There are a few steps for this cake because of the 3 main elements of the cake so this isn’t a quick cake to make. But it’s totally and completely worth your time! Mix all of the dry ingredients together in a bowl and then stir in the wet ingredients. Divide the batter between 3 greased cake pans. As the cakes cool, make the peanut butter frosting by beating the peanut butter with butter and then mixing in the powdered sugar, vanilla, salt, and heavy cream. Stack the layers with frosting in between and schmear a quick scratch coat of frosting on the outside of the cake to prevent crumbs. Chill. Frost with a thick coat of the frosting. To make the ganache, melt the chocolate, peanut butter, and corn syrup together in a small pan then whisk in half-and-half. Pour ganache over the top of the cake and spread it out so it drips down the sides. Chill for 30 minutes for serving. 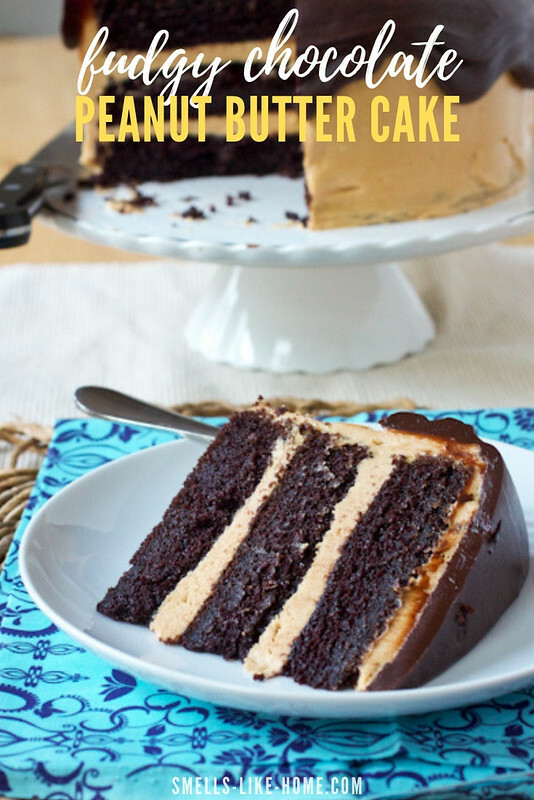 What I love about this peanut butter ganache is that you can use it in so many other ways! The ganache takes less than 10 minutes to make so it’s kind of a no brainer! For this cake, juuuust when you think the ganache is going to make a huge mess all over the cake plate, the drips stop themselves. It’s so fun to watch! This cake is just that good. Make this cake. Trust me. And then please come back to let me know how much you loved it! This cake has gotten tons of rave reviews – it’s time to add yours below! 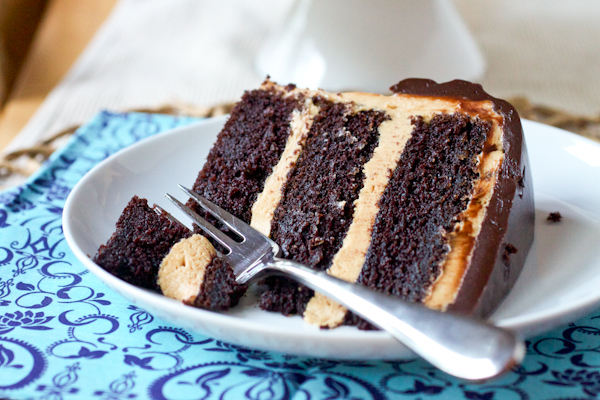 Fudgy chocolate peanut butter cake is what chocolate peanut butter lovers' dreams are made of! 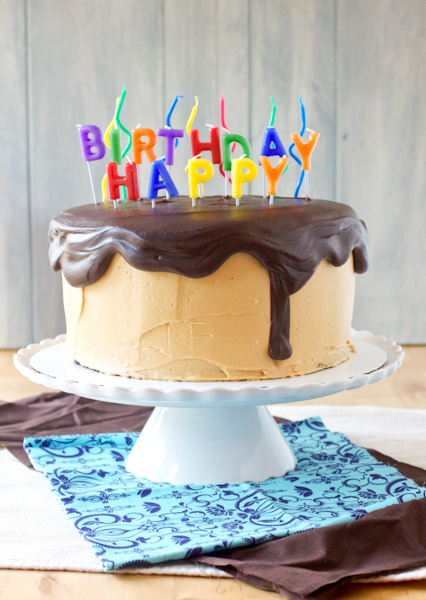 With 3 layers of super fudgy, brownie-like cake, creamy peanut butter frosting, and a drippy chocolate peanut butter ganache, this cake will "blow" all of your other birthday cakes away! 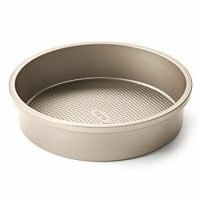 To make the cake: Preheat the oven to 350° F. Grease (no flour is needed here) three 8-inch round cake pans with butter or baking spray. Line the bottom of each pan with a round of parchment paper and lightly grease the paper. In a very large bowl, sift the flour, sugar, cocoa powder, baking soda, and salt. Whisk to combine them well. Add the oil and sour cream and whisk to blend. Gradually beat in the water - splashing may occur if you add it too quickly (trust me). Blend in the vinegar and vanilla. Whisk in the eggs and beat until well blended. Scrape down the sides and bottom of the bowl and be sure the batter is well-mixed and no flour bits remain. Divide among the 3 prepared cake pans - using a kitchen scale really helps to ensure the layers will be equal in size. 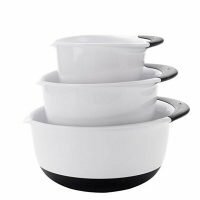 Bake for 30 to 35 minutes on the same rack, if possible, without the cake pans touching each other, or until a cake tester or wooden toothpick inserted in the center comes out almost clean. Let cool in the pans for about 20 minutes. Invert onto wire racks, carefully peel off the paper liners, and let cool completely. To make the frosting: In the bowl of a stand mixer fitted with the paddle attachment, place the peanut butter and butter. Sift the sugar into the bowl. Add the vanilla extract and salt. Starting on low and gradually increasing (to prevent the sugar from covering your kitchen) the speed to medium-high, beat the ingredients until light and fluffy, scraping the sides and bottom of the bowl as needed, about 3-4 minutes. Beat in the heavy whipping cream. 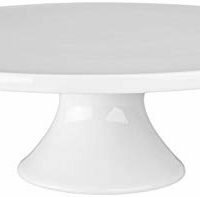 To frost the cake: Place one layer, flat side up, on a cake stand, cardboard cake round, or large serving plate. Spread ⅔ cup of the peanut butter frosting evenly over the top. Repeat with the next layer. Place the last layer on top and frost the top and sides of the cake with a scant amount of frosting to make a crumb coat to keep the crumbs from popping through the final frosting. You'll need just enough to lightly cover the cake - there's no need to be neat here. Let the cake chill for 15 to 30 minutes until firm, then use the remainder of the frosting to create a smooth final coating. Once the cake is fully frosted, chill the cake again and let it firm up before covering it with the ganache. To make the ganache: In the in a medium bowl set over a saucepan of simmering water, combine the chocolate, peanut butter, and corn syrup. Cook, whisking often, until the chocolate is melted and the mixture is smooth. Remove from the heat and whisk in the half-and-half, beating until smooth. Use while still warm. To decorate with the ganache: Gently pour the ganache over the top of the cake, and using an offset spatula, spread it evenly over the top just to the edges so that it runs down the sides of the cake in long drips. Refrigerate, uncovered, for at least 30 minutes to allow the ganache to set completely. Take the cake out of the fridge about 1 hour before serving - it will be difficult to cut through the ganache if it is too cold. This may seem like a daunting recipe, but I promise, it comes together in just a few steps. I strongly advise placing the cooled layers in the freezer right on the cooling racks for 30-40 minutes before assembling the cake - this small step will prevent the soft cake layers from cracking as you assemble. If you're limited for space in your fridge, assemble the cake on a cardboard cake round or large plate so that you can easily transfer it back and forth from counter to fridge in the final couple steps of the recipe - a cake stand plus this enormous cake will fit in few fridges.